When training in the gym, doing home exercise or running you will get far faster hydration (the speed at which water gets into your system) with a sports drink containing electolytes. In addition Hydrate is ideal s part of a low calorie plan. Convenient, low calorie, almost sugar free, hypotonic electrolyte, orange flavoured sports drink for advanced hydration. 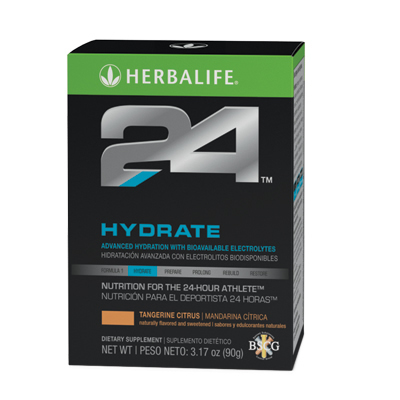 Athletes or physically active people who need low calorie hydration. Athletes during strenuous or prolonged exercise. Anyone who has a physically demanding job or works in hot, dry conditions. Only 1g sugar and caffeine free! The hypotonic electrolyte content ensures instant hydration and uptake of fluids is even faster than that of pure water for advanced hydration. Water alone is not effective at rehydrating after strenuous or prolonged exercise, Hydrate contains a blend of Sodium, Calcium and Magnesium which replaces the salts lost through sweating; restoring the electrolyte balance is key to proper hydration and improved performance. Contains a high portion of B and C vitamins which act to better extract energy from the nutrition you eat and protect against free radical damage, respectively. This allows you to exercise harder for longer while keeping you protected from cell damage. Athletes who drink Hydrate before, during and after activity report feeling improved concentration and mental clarity – they also suffer a significantly reduced amount of muscle cramps, fatigue and headaches which can be caused by dehydration. Even a 2% drop in hydration levels can affect performance! Mix 1 stick pack with 16 fl oz of water. Contains less than 15 calories and only 1 g of sugar. Convenient “on the go” packaging allows for hydration anytime. Maintain proper fluid levels throughout the day.